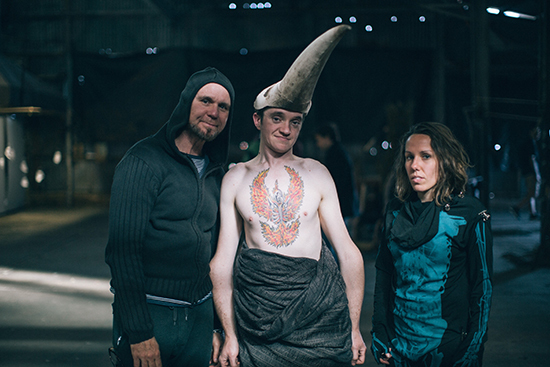 In Part I of For All We Know (or thought we knew), dancer, choreographer and marine environmentalist Dean Walsh wrote of the experience of discovering that he was living with a disability. In Part II, he describes how working with Restless Dance Company, Murmuration, Catalyst Dance and RUCKUS has inspired him, developed self-awareness and helped him build an inclusive methodology for shared performance-making. Back in early 2010 Philip Channells, then newly appointed Artistic Director of Adelaide-based inclusive company Restless Dance Theatre (RDT), invited me to make a work for the new touring company. I facilitated a workshop for about 30 people who orbited RDT activities at the time to try out some physical ideas and gain a sense of what working inclusively might entail. It was a bit of a baptism by fire but I absolutely loved it. At the end of the two days I told Philip that what seemed to stand out to me was a phenomenon of fierce adaptability. These people all seemed to constantly adapt to so much in life, not just artistic ideas and tasks. This was no more evident than when I went to lunch with some of them on day two. So I was interested to look at this idea of adaptation as an overriding theme for the work I’d devise with these people and with the working title True to Nature, because it was about their physical and neurological reality. I started to talk to a young and emerging artist, Matt Shilcock, whom I have since mentored over the last five or so years. Matt is a highly intelligent and gifted artist who identifies as living with a congenital physical disability. He is the very epitome of adaptation. He overcomes his physical hurdles time and again to produce conceptually dangerous works that, without necessarily aiming to, sit within a new type of avant garde. Matt became a member of RDT and our cast. He and I talked about his history and he revealed that he loved Teenage Mutant Ninja Turtles, X-Men and Martial Arts history as a kid and their acceptance of ‘mutants’ into their troops. We discussed the recent resurgence of ‘mutants’ as powerful and empowering heroes and heroines and this brought us to a subtext we’d look to explore for him within True to Nature. We are all mutations of the primate gene pool. Mutation is a part of evolution, some successful some not—but genetic mutation defines evolution. I also came to discover that mutation offers a very useful movement composition method that I have since employed in all my practice. Next I had to consider how I’d work with all members of the cast inclusively on such a subject. Apart from Matt the diverse cast was made up of independent dance artists Elizabeth Ryan and Miranda Wheen and RDT dancers Dana Nance, Jianna Georgiou and Andrew Pandos, so I had my work cut out in terms of making the process entirely inclusive and in no way imposing ideas. A challenge most definitely, but I was up for it. 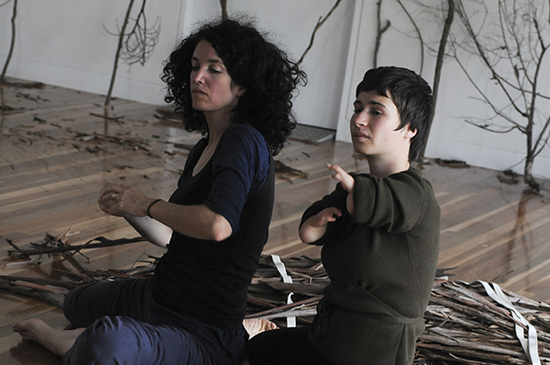 In our three-week Bundanon residency in 2011, I orchestrated various immersions in nature in order to gather sensory information that we could all relate to through embodied experience. We called the big she-oak down by the river our “family tree” and spent an entire day around her dreaming creativity into her branches and back out to our group discussion. Blind-folded tasks allowed us to meet our various intellectual differences within a common physical application, opening us up to the themes and how each of us might comprehend them. We’d go back into the dance studio and see what we each had distilled and from there talk about how we might adapt our material to suit one another. In other words, we were in constant states of mutating our individual findings and ideas to work out ways to include one another. I adopted a ‘leave no one out’ approach. 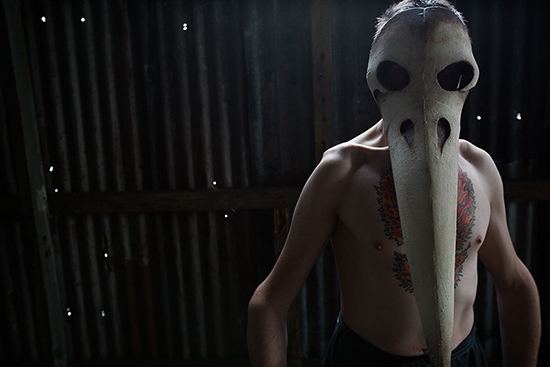 I needed to constantly shift and challenge my preconceptions if I was to direct a work that would reflect upon genetic mutation to help demonstrate the redundancy of prejudice based on physical and/or neurological difference. I was very new to this then but I loved the challenge. Having to think on my feet and constantly review if I was practising an authentic inclusion or just imposing my creative dictatorship on others. It didn’t always work but when it did we found we’d made some stunning passages. The material is all on video and I look forward to perhaps one day revisiting it and finally finishing the work for an audience to experience. 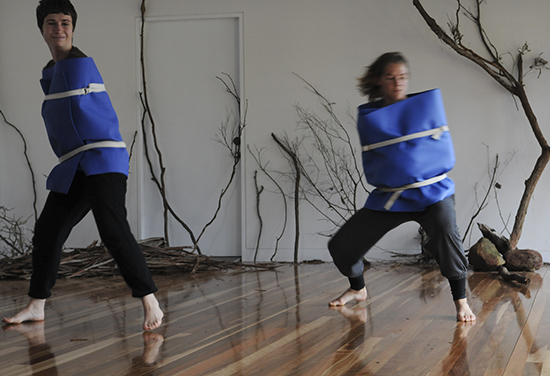 Post my experience with RDT I attended the Accessible Arts Catalyst Dance Program symposium at Carriageworks in 2011. This was another turning point for me. I met some great people who were all very experienced in inclusive practice, in particular, Alison Richardson who was director of Beyond the Square, the disability inclusive program at Riverside Theatres, Parramatta. Under this umbrella she had formed a performance group known as Ruckus Ensemble, now just RUCKUS. At the symposium she asked me if I’d like to come in and teach some classes for the group. Five years later and with three major works under our belt RUCKUS are still together with some incredible stories to tell (another time). Alison and I position ourselves as co-collaborators alongside the members of the group. Our last work Speed of Life was presented at PACT centre for emerging artists, receiving a lot of praise as a significant contemporary performance work, let alone one that was led by six people living with intellectual disability who are professional artists in their own right. 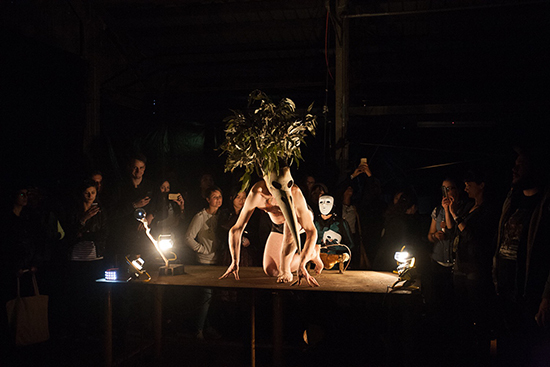 In tandem with these two company engagements I’ve also worked as workshop facilitator and artistic advisor for Sydney-based inclusive dance company Murmuration and as facilitator and mentor for the Catalyst Dance Program through Accessible Arts in Sydney. Catalyst afforded me the chance to work with many different bodies and minds and learn how to develop my own PrimeOrderly methodology into an entirely inclusive movement research practice. If I am to reflect on the state of our marine environments but exclude certain people then I’m not being at all environmentally sensitive and my inclusive practice would be unsound. So I continue to develop its properties and get feedback from participants and adapt it accordingly. How do I engage with people with disabilities? When I say “inclusive,” by definition I do mean some major adapting has to happen on my part as much as on the part of the workshop participant or cast member living with disability. When the group I’m working with has a very diverse range of abilities I am in a position of constant renegotiation with my ideas and how to implement them fairly and encourage ideas from each person to be heard and at least tried out and given a run. Often these spark alternate routes to finding more specific meaning in a scene. This can be an extremely tiring process at times, a bit like a head chef also playing waiter, maitre d’ and dishwasher, but it is a process that also suits the speed at which my mind often works. It gives me a chance to try out so many ideas and reiterations of these that might otherwise be missed opportunities in an able-bodied or neurotypical setting. But to go into more depth about the process of facilitating workshops or productions is for another article. What I will say is that, if you’re open to learning, working outside your comfort zones and usual directorial timeframes and are ready to slow a process right down and to truly listen, then your artistic leadership skills will develop ten-fold. It also awakens you to a whole new work ethic and more democratic creative authority. It isn’t good enough to have people with diverse abilities in your class or rehearsal room sitting in a corner because you don’t know what to do with them, and then call it inclusive. This is not inclusion and it most definitely is not integration. In the inclusive arts sector we call this “tick-the-box practice” and it irks us senseless. Working in the inclusive sector has awoken me to so many new and positive attributes of my practice but also myself. It has awoken me to my own identity as someone living with disability, one you cannot always see and is not always evidently ‘disabling.’ Finding the disability arts community and becoming a part of its growth from strength to strength has been totally serendipitous for me. I knew I’d found my clan but it wasn’t until 2015, when I was finally diagnosed with Complex Trauma Disorder (considered an acquired disability) as well as Autism Spectrum Disorder/Condition that I suddenly realised why I had found such a brotherhood and sisterhood in the inclusive arts community. Here I can be my differently wired self. Congenitally, I am not normal, after all, thank God! Here I can be accepted for my sometimes overwhelming picture brain and sensory-emotional overloading and fall in and out of clarity without judgment. Here I can ask for the extra support I sometimes need in order to function without feeling categorised, shunned or dismissed. I understand the power of being acknowledged for who you are in all that you are. I have for so long so often felt like I’m viewing situations through an impenetrable membrane – I’m there but not there with far too many thoughts, full of extraordinary detail, functioning all at once that I can even feel physically ill. This is a fairly common trait of the Aspergian/Autistic mind and far too often misunderstood by neurotypical people. At the risk of sounding a little daggy, not only have I found my clan within the disability inclusive community, I’ve finally started to find my authentic self and the systems of practice I need to better function as a leading artist with an ‘invisible’ (well, sometimes) disability.